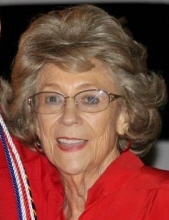 Sara Daniell Duren, age 81 of Carrollton, passed away April 10, 2019. She was born September 23, 1937 in Douglas County, daughter of the late Leonard Daniell and Hester Reynolds Daniell. Sara worked as a seamstress at Cluett & Peabody for more than 40 years and attended Mt. Zion United Methodist Church. In addition to her parents, she is preceded in death by her husband, Larry V. Duren; sisters and brother-in-law, Loyless Morris and Virginia and Robert C. Eidson; infant brother, Hubert Daniell; and special nephews, Danny Eidson and Eddie Morris. Survivors include her son and daughter-in-law, Larry V. Duren, Jr and DeAnn of Carrollton; sisters, Lavata Buice and Carol and Joe Buckner all of Douglasville; two grandchildren, Shelby Duren and Ryan Duren both of Mt. Zion; and several nieces and nephews. Funeral service will be conducted Saturday, April 13, 2019 at 11:00 AM from Martin & Hightower Heritage Chapel with Rev. Don Richards and Mr. Donald Nixon officiating. Interment will follow in Sunrise Memoria Gardens. The family will receive friends at the funeral home Friday, April 12, 2019 from 5:00 PM until 8:00 PM. Messages of condolences can be sent to the family at www.martin-hightower.com . To send flowers or a remembrance gift to the family of Sara Daniell Duren, please visit our Tribute Store. "Email Address" would like to share the life celebration of Sara Daniell Duren. Click on the "link" to go to share a favorite memory or leave a condolence message for the family.